This is the story of our family cruise along the route of Captain Vancouver's 1792 exploration. It has given me a great deal of pleasure to read the remarkable journal of Captain George Vancouver's trip. In his journal he describes the early exploration of the waters of Puget Sound and the waters north along the coast of what is now British Columbia. His writing is personal and full of vivid description that gives an immediate feeling of what this area was like in the year 1792. In some ways everything has changed, and in other ways very little has changed. The mountains and the wilderness are still impregnable, inhabited by more bears than people. Half a world away from their home country, the intrepid sailors of Vancouver's crew sailed in uncharted waters in very challenging conditions. I hope it will be as interesting to you to read some of the excerpts from Vancouver's log. Along with the excerpts I will tell the story of our summer trip. Let's begin in Desolation Sound. What a name for a beautiful place! Our first year when we sailed to this land of towering peaks we relabelled our chart to read "Destination Sound". "The resting place we then occupied afforded not a single prospect that was pleasing to the eye, the smallest recreation on shore, nor animal nor vegetable food. Nor did our exploring parties meet with a more abundant supply, whence the place obtained the name Desolation Sound." - from the log of Captain George Vancouver, June 1792. Vancouver reached Desolation Sound in June and had a couple of discouraging weeks of rain and fog. He refers much more favourably to places where he anticipates farming can be successful, primarily the gentler terrain in the southern parts of Puget Sound. He was right in his expectation that the mountainous areas of Desolation Sound could never lend themselves to human habitation. It is this inaccessibility and remoteness which now provides the greatest attraction to this region of splendid mountain landscapes and towering snow-clad peaks. By the time we arrive in Desolation Sound in mid July, the clouds are gone. Sun and blue skies prevail. The days are long and lovely. It gets light at 4:30 in the morning and stays light until almost 11 in the evening. But we do not stop here this year, for we are heading farther north. We are heading to the remote channels and islands of the Broughton Island group north of Johnstone Straits. From Desolation Sound we continue north into the channels between mainland B.C. and Vancouver Island. In these channels, especially at narrow points, with steep mountains on either side, the winds and currents are funnelled together to become very powerful. The largest of the passages is Johnstone Strait. Members of Vancouver's expedition were the first Europeans to pass through Johnstone Strait. Vancouver's mission was to discover a Northwest Passage across the top of North America. In the part of his journey from Desolation Sound north, he is also interested in discovering whether the land to the West of Puget Sound (Vancouver Island) is an island separated from the mainland by navigable water or a part of the mainland. In relatively narrow channels he is navigating a square rigged sailing ship which is so unwieldy that it can barely make progress upwind. Gale force winds blast through the long straits between the mountains. Tidal rapids reach velocities of 12 and even 14 knots sometimes forming huge whirlpools. As soon as we sailed north of Desolation Sound, the skies began to get cloudy and the weather became less predictable. With our careful timing to arrive at slack water, the rapids caused us no trouble and we found bays off the channels to anchor in where the depths were not too great, since it is hard to anchor in water over 50 feet deep. After following the channels north of Desolation Sound, we sailed down one of the first channels that leads to Johnstone Strait, Nodales Channel on the north side of Sonora Island, shortly after going through Yuculta and Dent Rapids. Mr. Johnstone continues farther north in the narrow channels and then enters Johnstone Strait through a channel slightly farther along. Once in Johnstone Strait, he "continued along the northern shore of the great western channel for the most part upwards of half a league wide, in the firm reliance of finding it lead to the ocean. Under this impression, Mr. Johnstone thought it of importance to ascertain that fact as speedily as possible; for which purpose, he steered over to the southern shore, leaving some openings, with some islands and rocks, on the northern side, for future examination. The southern shore was found nearly straight, and entire, rising abruptly from the sea to mountains of great height. Here they passed some small habitations of the natives, but the northern shore presented not the least sign of its being inhabited to the westward of the narrows. A slow progress was now made to the westward, in consequence of a fresh gale from that quarter, most part of the day; and the nights and mornings, often obscured in a thick fog, were generally calm." "On the morning of the 8th, on the fog clearing away, a small canoe appeared, which attended them until they reached a village of greater consequence, in point of size, than any they had before seen, situated on the front of a hill near the sea-side. The village had the appearance of being constructed with much regularity; its inhabitants numerous, and all seemingly well armed; under these circumstances it was passed by, without further inquiry, agreeable to our established maxim, never to court danger on shore when necessity did not compel our landing. A small sandy island, lying to the eastward of the village, affords between it and the land on which the town is situated, a small, but very commodious, anchorage. To the south of the village a valley extended, apparently to a considerable distance, in a south-westerly direction. Through it a very fine stream of fresh water emptied itself into the sea, from the many wears that were seen in it, it was unquestionably well stocked with fish, though not any was offered for sale, notwithstanding the solicitation of our party in the Nootka language, with which the natives seemed well acquainted. After the chief had received some presents, amongst which copper seemed to him the most valuable, he, with most of his companions, returned to the shore." "In the hope of reaching the westernmost island in sight, and by that means determining the great object of their pursuit, they proceeded with a fresh gale from the east, attended with a great fall of rain, until midnight; when supposing themselves at the limits they had seen before it was dark, they came to a grapnel under the lee of a small island, which in some degree sheltered them from the inclemency of the night. This extremely unpleasant weather continued without intermission, the whole of the next day, and until the morning of the 10th. They had now been absent six days out of the seven for which they had been provided, and the small remains of their stock were becoming hourly more insufficient for the distant voyage they had yet to perform in returning to the ships, which greatly increased the mortification they experienced by this very unlooked for detention; but a westerly wind and pleasant weather returning with the morning of the 10th, they rowed to an island conspicuously situated, from whence their expectations were gratified by a clear though distant view of the expansive ocean. This island obtained the name of Alleviation Island, from whence they directed their course homeward, being upwards of 120 miles from the ships. Impelled by reasons of the most pressing nature, no time was lost in taking advantage of the prevailing favourable gale, with which they kept on their return until midnight, when as usual, they landed for the night on the southern shore, nearly opposite the west end of the island that forms the south side of the intricate passage they had passed through on the 6th. Departing with the dawn, they sailed through a clear and spacious channel, in width about half a league, without the smallest interruption, or the least irregularity in the tides. The southern shore, which from the large village was nearly straight, afforded some few small bays, the land mostly rising in an abrupt manner from the sea to mountains of considerable height, divided by valleys that appeared to extend a great way back into the country; the shores were tolerably well inhabited by the natives who lived in small villages near the water side. The northern shore was neither so high nor so compact; several detached rocks were seen lying near it, and it was, generally speaking, composed of rugged rocks, in the fissures of which an abundance of pine trees were produced, constituting as on the southern shore, one intire forest. As they advanced in this channel, leading nearly in an east and west direction, they observed another which led to the south, south eastward, bearing every appearance of being clear, navigable and communicating with the gulf; and one also stretching to the north-eastward, which they had little doubt was the same they had seen after passing the narrows on the 4th, leading to the S.W. The former of these they much wanted to explore, but their provisions being totally exhausted, it became expedient they should join the ships without further delay and therefore pursued that leading to the north-eastward, by which they arrived." -- This last channel through which Mr. Johnstone sailed in returning to the ships was Nodales Channel, the same channel we sailed through in "Fantasia" to reach Johnstone Straits. 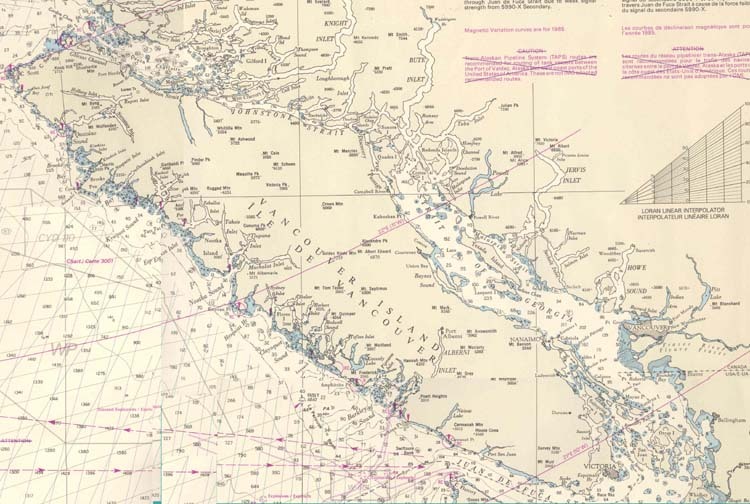 The channel which Mr. Johnstone observed leading to the south was the channel through Discovery Passage and Seymour Narrows which comes out at the top of Puget Sound. Upon Mr. Johnstone's return, Vancouver sets sail in his ship "Discovery" followed by the smaller ship the"Chatham". Vancouver sails around Point Mudge and into the south end of Discovery Passage, which he has correctly guessed to be the same passage that Mr. Johnstone sighted at the conclusion of his trip. After sailing up Discovery Passage, Vancouver enters Johnstone Strait at Point Chatham, across from Nodales Channel. And then Vancouver began to battle his way up Johnstone Strait. "After we had proceeded about ten miles from Point Chatham, the tide made so powerfully against us as obliged us, about breakfast time, to become again stationery in a bay on the northern shore in 32 fathoms water. The land, under which we anchored, was a narrow island, which I distinguished by the name Thurlow's Island, it is about eight leagues long, and was passed to the northward by Mr. Johnstone in going, and to the S.E. on his return. The bay affords good anchorage; and wood and water may be easily procured. Our efforts with the seine, though unremitted, were ineffectual, not having afforded us the least supply since our departure from Birch bay; nor with the hooks and lines, had we been more successful." "About four in the afternoon, we again proceeded, but made little progress against a fresh westerly gale. In the evening we passed another village, when the inhabitants, more knowing than their neighbors, embraced the opportunity of the ship being at stays, of selling a few small fresh salmon. They had some with them ready cooked, and they seemed to have great pleasure in throwing them on board as we passed their canoes. We anchored again about nine in the evening, on the southern shore, nearly abreast of the west end of Thurlow's Island, in 22 fathoms, sandy bottom; having gained this tide, little more than three leagues." "The wind blew strong from the westward with squalls, during the night; and when we weighed, at three in the morning of Tuesday the 17th, we were obliged to ply, under double-reefed topsails, to windward, with little prospect of making much progress, until we had passed Thurlow's and Hardwick's islands. Robyn looks out from under a tight hood as the winds continue to blow near gale force. "The meeting of these channels added great velocity to the tides; and as the day advanced, the weather became fair and pleasant, which enabled us to spread all our canvass; yet we were very apprehensive of losing, by the adverse tide, all that we had gained by the favorable stream; not having been able to reach bottom with 100 fathoms of line, although repeated trials had been made, on traversing within a ship's length of each shore. At last, about eleven, in a small bay on the southern side, soundings were gained at a depth of fifty fathoms, where we instantly anchored, about half a cable length from the rocks, to wait the return of the favorable current." After three more days battling wind and current, Vancouver reached the western end of Johnstone Straits where he saw "through an opening, a much greater space so occupied with water, than that which comprehended these straits." Mr. Broughton, who is the commander of the smaller vessel the "Chatham", is sent off to investigate the channels to the north at this western end of Johnstone Straits. Mr. Broughton sails in the "Chatham" up Calls Channel and Knights Inlet, to both of which Vancouver gives their names, and then Mr. Broughton continues onwards to sail around the Broughton Island group which Vancouver names the Broughton Archipelago. Very little has changed since Mr. Broughton passed through these channels. In a few of the bays there are float homes and floating docks now, but there are no permanent structures on shore. This area is still remote from any roads or towns. After Mr. Broughton returns to the ships following the exploration of the Broughton Archipelago, both the "Discovery" and the "Chatham" head for the north end of Vancouver Island. Near disaster struck when the "Discovery" sailed onto a rock ledge and was stranded as the tide fell. She heeled so far at low tide that when the tide began to rise, the water was only inches from pouring into the ports along her side and sinking her. After this escape the "Discovery" and the "Chatham" sail down the west coast of Vancouver Island to the small settlement of Nootka. Vancouver has instructions to inform the Spanish commandante at Nootka that the English are taking over control of Nootka and all of the surrounding territories. After stopping at Nootka Vancouver heads for Hawaii to spend the winter before returning to the coast to continue his explorations northward. We had some long days and terrific winds in Johnstone Strait with storm warnings up to 45 miles per hour. But once through Johnstone Strait we took time to relax. We met a nice family with two youngsters, Kathleen and Edmond, who are just a bit older than Robyn and Laine. We all got together for a pancake breakfast on Edmond's birthday. After breakfast, Edmond borrowed one of our 15 inch sailboats and spent the morning following it in his dinghy. Lainey was eager to do some fishing so she, with Robyn's help, cut a branch from a cedar tree and added a handle and fishing line. Within minutes of casting her line out, Lainey had caught a fat little pelcher about a foot long. Two more followed. Lainey cleaned them and we fried them up that evening. The afternoon was a fun combination fishing and sailing the T15 in the harbor off the docks. Two great kid activities! There were lots of bears in this northern country so we made a lot of noise on our hikes to let them know we were coming. The bears would come down to the water's edge at low tide to turn over the big rocks to get at the little crabs hiding beneath them. We were glad only to see black bears, although there were reports of grizzlies being around on the mainland. And then the whales. For three days we anchored in Boat Bay across from the Robson Bight Orca Preserve and watched the Orca whales. The majestic grandeur of these creatures so well fits the grandeur of their surroundings. While we were anchored in Boat Bay we got to meet the Robson Bite wardens. They have a whale watch observation post from which they document all of the passing whales. They also patrol the protected area to keep boaters from entering the area and disturbing the whales.They enjoyed watching one of our 15 inch boats sailing. That evening we joined them around their campfire for singing. Cynthia brought her guitar and we surprised one of the wardens who was from Australia by singing "Give me a home among the gum trees", which he knew well from his home country. After Boat Bay and watching the whales, it was time to head back down Johnstone Strait, this time with the prevailing winds at our backs. We had been sailing a little over four weeks now. On our second day sailing down Johnstone Strait, strange clouds appeared at the crest of the ridge of the range of mountains along Vancouver Island. The clouds surged over the ridge and plunged straight down the nearly vertical mountain face, moving with terrific speed. A williwaw, I thought, and we rushed to reduce sail. The fastening on the whisker pole jammed in the clew of the big jib. Robyn, Cynthia and I were all up on the bow deck wrestling to free the pole so we could get the jib in. There wasn't much time left! Lainey steered by herself as the wind screamed. Now we had reached the sea directly beneath the ridge and finally the pole came free and in seconds we had the jib rolled up. We were down to bare poles, no sails, and the wind was ripping. The gusts hit us at 70 knots plus, and we went blazing along without any sails. It was one of the high points of the trip, the sheer force and exhilaration of the wind as it raced against us. We had 40 miles of open strait ahead of us, so there was no threat with winds whipping as we surged along. After the excitement of Johnstone Strait, it is time to relax and enjoy some of the wonderful places of this northern country. Who would expect the warmest salt water north of Mexico to be here just to the north of Desolation Sound in Redondo Strait, between the two arms of the island of East Redondo? We anchored for three days and enjoyed swimming all day long and sailing our 15 inch model sailboat. Cynthia finds a quiet moment to catch up with her journal. Anyone for aqua-planing? We can pull Laine and even Robyn behind Fantasia when we are motoring, although generally we do very little motoring! Finally we stop at our favorite harbor in Desolation Sound and climb to a vantage point high over the harbor for a picture of Cynthia and Robyn and Laine. Every few summers we return to this same point for another picture, they become a record of our children growing up. This is Tenedos Harbor and far behind us in the upper corner of the harbor is Fantasia. Above the harbor is a beautiful lake for swimming. From Tenedos we head for home. As we get nearer we see Mount Baker - our mountain. It's good to be home again after 44 days of exploring and adventures. It's good to know that all of this beautiful country is so near. Those lofty peaks of the northern country and the incredible light streaming down through the clouds suggest a grandeur beyond the ordinary realm of day to day life. Mount Baker was named by Captain Vancouver after Lieutenant Baker, an officer on board the Discovery who first sighted the mountain. Bellingham was named by Captain Vancouver after Sir William Bellingham, who in England was the controller of the storekeeper's accounts of his Majesty's Navy. Thanks for joining us! I hope you enjoyed the sail!